Warm up your illustration skills with this spring-inspired tutorial for creating organic letters. Use of a Wacom tablet is recommended but not required. Before we get started I'd like to give credit to the inspiration for this tutorial. The work of Charles Gary inspired me to create this illustration. Having been inspired by his work, I believe it's important to expand on and make something that's thematically and artistically my own. Having said that, lets get on to the tutorial! This tutorial makes use of a Wacom tablet but is not required. If you don't have a Wacom tablet you can still follow along step-by-step but you won't be able to adjust your Pressure sensitivity using just a mouse. Lack of a Wacom tablet will impact the ability to create tapered edges to your lines. Although, you can still achieve natural looking curves and shapes. Start by opening your Brushes Palette (Window > Brushes.) You can create a new brush or modify an existing one. We'll just modify an existing brush. Double-click the brush highlighted below. The only setting we'll modify is the Diameter. Set the Diameter to about 10 and set the variation to the same. If you have a Wacom tablet, set the middle drop down to Pressure. If you don't have a Wacom just leave the drop down as it is. Using the Paintbrush Tool (B) to draw an "s" shape. You can adjust the stroke size to achieve different results. If your letter is much too thin or thick, double-click the brush in the Brushes Palette or alter the stroke weight. I usually draw each letter several times until it looks just right. Continue to draw the other letters of the word one at a time. This will give you a better opportunity to craft each letter precisely how you'd like. Below, the entire word is written out. After you have all the letters drawn, go back and add flourishes to the beginning and end of the letters. They don't have to line up perfectly, we'll fix that next. Once you're satisfied with the overall look and flow of the letters expand all the letters by going to Object > Expand Appearance. After that, Unite them using the Pathfinder. Use the Delete Anchor Point Tool (-) and clean up the messy areas of the letters. You want to achieve a smooth line as shown below. Next, make a copy of the letters and paste it directly on top (Command + F) of itself. Give the top copy a thick stroke with no fill and the bottom copy should just have a green fill. You should have two sets of letters now. Expand the letters with the black stroke by going to Object > Expand Appearance. Using the Direct Selection Tool (A) drag the points of the black outline so that the outline becomes more varied and natural looking. Lock the green letters if necessary so that you're not inadvertently selecting them at the same time. Observe how I've varied other areas as well. Once you're finished varying the outline make sure to adjust the green shape so that there's not white gaps between the black and green. Use the Direct Selection Tool again to accomplish this. To create the impression of volume we'll add more black lines and shapes where needed. Use the Pen Tool (P) as opposed to the Paintbrush Tool this time. The Pen Tool will give you more control over what you're drawing. Since these shapes will indicate how the letters curve and overlap, the Pen Tool will give us more control over small details like this. Use your imagination to envision where the letters could fold. Accentuate what you've already drawn; I essentially started drawing in corner areas. Give your letters a green to light green linear gradient. For the background, draw a rectangle using the Rectangle Tool (M) and fill it with a radial blue to light blue gradient. To add more volume to the letters, select the green shape that comprises the letters and go to Effect > Stylize > Inner Glow. Select Multiply for Mode, use green for the color and adjust the Opacity and Blur to your liking. We'll give the letters a subtle texture by drawing arbitrary shapes using the Pencil Tool (N.) The Pencil Tool will allow you to more organically draw shapes over the letters. Give the texture shapes a green to white linear gradient and set them to Multiply in the Transparency Palette. To create the small vines that wrap around the letters simply use the Pen Tool to draw the basic shape. After that, draw another smaller shape inside the black shape and fill if with the green gradient. Copy and paste these vines throughout the illustration in various groups to achieve a random look. 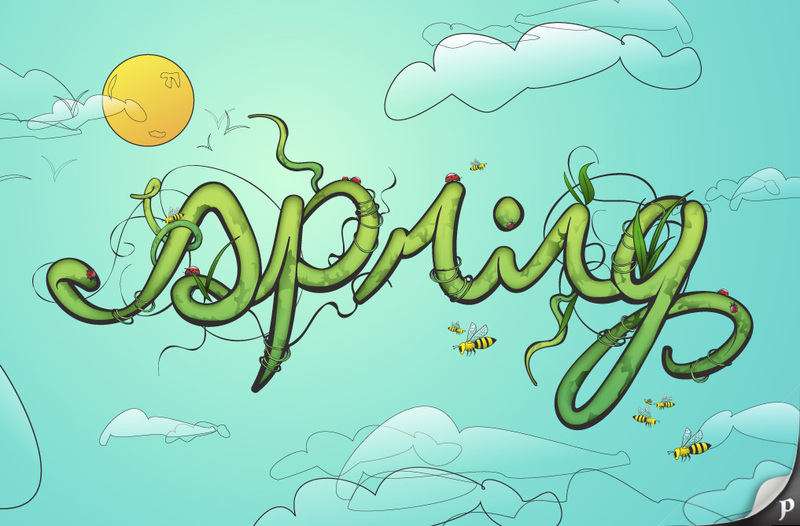 To create the black vines in the background use the Paintbrush Tool, as we did to create the word "spring." To make the vines really skinny simply adjust the stroke weight. We'll add other details like leaves by using the Pen Tool to draw the basic shape of the leaf. Since the leaves are going to be small we only need to apply a stroke to the shape. There's no need to make two leaves and adjust the outline. Place the leaves throughout the illustration. This is what your illustration should look like right now. Draw a rectangle over the circle and click Minus Front in the Pathfinder to cut the shape in half. Draw a series of other ovals to give the ladybug spots. The head is just an oval that's behind the main body of the ladybug. Use the Star Tool to draw the legs of the ladybug. When you are drawing the star press the down key on the keyboard to reduce the amount of points the star has. You'll obviously only want three points, as a triangle has three sides. Select the ladybug's main body and the black ovals that overlap it, and then in the Pathfinder select Divide. Ungroup the objects and get rid of the unnecessary shapes around the edges that are leftover. This is what your ladybug should look like right now. We'll warp the ladybug to add more of a cartoon-ish look to it. Select it and go to Object > Envelope Distort > Make with Warp. Select Arc from the Style drop down and enter about 30 for the Bend. Go to Object > Expand then click OK. In some instances, the warp shape may be clipping the ladybug. If this is the case, use the Direct Selection Tool and adjust the points so that your entire ladybug is showing. Now, the entire ladybug is visible. Draw another arch shape over the top part of the ladybug and fill it with a white to transparent gradient to create a reflection. You can further draw a black shape behind the ladybug so the style matches that of the spring letters. To create the bee you'll predominantly use the Pen Tool. Draw the more organic shapes using the Pen Tool and use the ellipse for things like the center of the body. For the details in the wings use the Pencil Tool (N) so the lines look more random. Use the Pathfinder's various functions as we've used previously to tidy-up the shapes that comprise the bee. Color the bee and place it throughout the illustration. It's important to note that you should group items in clusters rather than place one bee here and one bee there. Clusters allow you to create an overall flow for your composition while one-off bees make everything look scattered. This concept applies to any elements within the illustration, bees, ladybugs, leaves, vines ,etc. To make the clouds use the Pen and/or Pencil Tool and draw arbitrary yet visually appealing organic shapes. Even though the clouds look very random, they do have a level of artistic quality about them. This is an important concept to note. Even though clouds are, by nature, random, just scribbling with the Pen Tool may not produce good results. The other factor to take into consideration is that of line weight. Clouds that are farther away will have a thinner stroke, while clouds that are closer to the viewer will have a thicker stroke. Give some choice clouds a white to transparent gradient. Apply the gradient sparingly, as overuse will make all your clouds look too similar. Last, draw the sun and give it a yellow to orange gradient. Be sure to give it subtle details on the surface so it doesn't look foreign. Composition – the composition feels organic and I've made judicious use of clusters of objects like clouds, insects and vines. Color – nothing stands out too much and isolates your focus. When looking at your illustration you can use the Saturation dialog (Edit > Edit Colors > Saturate) to make adjustments to the intensity of your colors. Style – the style of the full and thick letters in contrast to that of the thin and light background complement each other. All these elements come together to create an intriguing final illustration.